Shop the sales: Watch for clothing sales at shopping malls or online, even before back-to-school fashions hit the racks in mid- to late summer. Also, plan ahead and buy winter clothes off-season, when they’re discounted. Prices for warm-weather clothing start to go down in June. By the time the weather is colder, you’ll have already stocked up on winter clothes to keep your children warm. 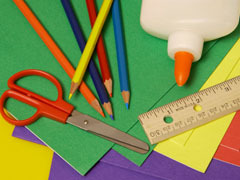 Buy in bulk: If you have a larger family, a great back-to-school savings tip is to buy frequently used items in bulk, such as computer paper, notebooks, pencils, and glue sticks. Warehouse stores, dollar-value stores and online auctions are all places where one can buy in large quantities. Just don’t get too carried away. Think long-term savings, not short-term trends: Beware the trendy sneakers, designer purse and must-have tech gear, unless you want to succumb to sticker shock. Look for affordable alternatives to the latest and most expensive items on your kids’ back-to-school wish lists. Resist the temptation to be the cool parent who buys with abandon. The best back-to-school bargains may not always be trendy, but if the items fulfill their intended purpose, they’re still the better buy. Take a breath: Don’t fall prey to urgency. Buy just what your children need to start the school year. Spread the rest of the shopping throughout the calendar year. Sales during the December holiday period offer the opportunity to replenish clothing, sports equipment and other items. If you look for sales and promotions, you can get deals all year. Consider stockpiling some items, such as clothes a size larger for next year’s school season. Look for ways to get money back: When buying computers, printers and other tech items, look for deals that offer rebates. Make it a habit to get the rebate form and proof of purchase into the mail as soon as you know that your newly bought equipment is in working order. That way you won’t forget you’re due money back, or a credit. Don’t neglect the returns: It’s easy to let that T-shirt that wasn’t quite a hit gather dust in a closet. Or, maybe you’ve bought too many packs of pencils or sticky notes, but figure that someone else will use them – eventually. We all make mistakes when it comes to back-to-school purchases. Cut your losses by returning those items to the store as quickly as possible, or by shipping them back to the merchant if you ordered them online. Keep all of your receipts and be aware of stores’ return policies to ensure proper refunds. Involve the kids: There’s always an element of excitement in back-to-school shopping, especially for the little ones. Make sure that you let your kids pick out at least some of their own school items, but within a reasonable budget. The quality time spent with your children selecting “something special” for school is priceless. What’s your best back-to-school savings tip for finding bargains? Share the wealth by posting it to our Facebook page.